Every stamper was stirring in wake of this fun event! Just a wondering which stamps Tim Holtz will show. will keep you from the busy mall. Crackle Paint, especially Rock Candy. The tag pictured is one of my favorites from the Day 10 of the 2009 12 Days of Christmas. Get your friends together to pool your supplies and resources. 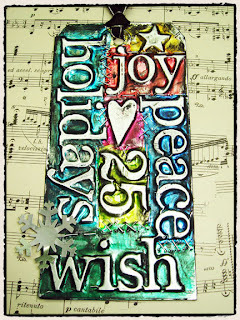 Make a stamp date to enjoy some holiday cheer with friends during the 12 Tags of Christmas hosted by Tim Holtz. Here's a coupon code to enjoy during a variety of 12 Days of Christmas events: madabout12. This coupon code (min $10 purchase) will be good until December 31st. 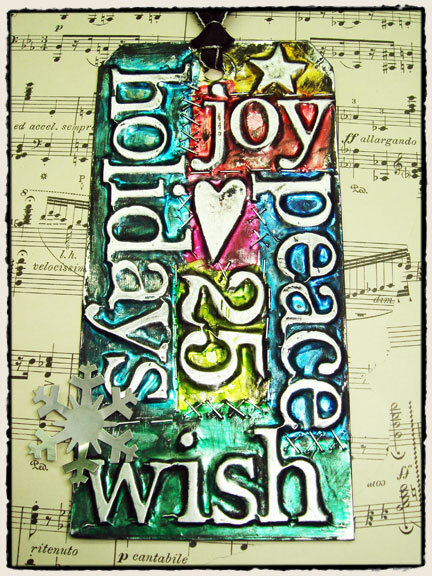 You can use it as many times as you need between now and the end of the year to shop at eclectic Paperie. Daisy, just LOVE your poem! Anxiously awaiting the clock to strike 12 midnight to see what the fab mr. holtz has in store for us. Happy holidays to you and yours! Since that is 3 in the morning here-I'll have to be content with keeping up with Mario on twitter.